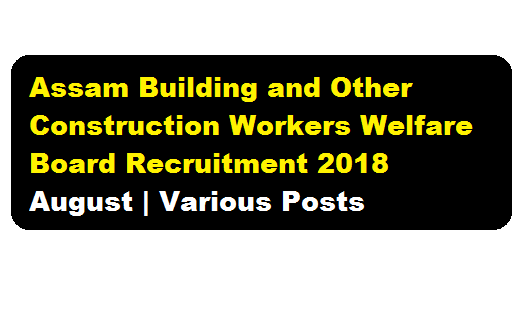 Assam Building and Other Construction Workers Welfare Board Recruitment 2018 August :- Assam Building and Other Construction Workers Welfare Board has published a recruitment notification in August 2018 for filling up various positions. According to the latest Assam Building and Other Construction Workers Welfare Board Recruitment 2018, Applications in Standard Form are invited from Indian Citizens for Walk-in-Interview at Assam Building and Other Construction Workers’ Welfare Board, for engagement in the positions and places mentioned herein below. The engagement is purely temporary and on Contractual Basis initially for maximum eleven months. The place of engagement is as shown at column 5 below or any other office as decided by the authority. In this section, we will discuss in detail about Recruitment of various posts under Assam Building and Other Construction Workers Welfare Board Latest Job Recruitment with all the details and requirement. Minimum required qualification :- Candidates must be Graduate in any discipline with minimum 50% marks with knowledge of Computer application (such as MS Word, Excel MS Power Point, Tally etc) under State/Central Government recognized Institution. (Preference will be given to those having working experience in the field of office work, scheme related project in any Govt. /semi Govt. undertaking or in private organization with good track record. 1 (One) each in the Office of The Assistant Labour Commissioner. a. Dhubri b. Nagaon c. Golaghat d. Silchar e. Board H.Q. Minimum required qualification :- Candidates must be MBA in Finance from recognized University with minimum 3 years of Experience in Project Financial Management . Candidate having experience in Financial Management of Skill Development Programmes will be given preference. *Provide assistance to the Board in terms of all receipts and expenditure of the Board Fund, reconciliation etc of Bank Amounts of the Board, Benefits disbursement, Bill Payment to the Contractors Service Providers etc. * Day to Day handling of Financial matters of the Board, particularly of the Skill Development Programme. * Assist the Board in implementing the various schemes. Minimum required qualification :- Candidates must be BE/MBA from Recognized University with minimum 3 years of experience in Project Management . Candidate must have experience in Tendering, Process for selection of Contractors/Service Providers. . Candidates must have at least one year experience in Evaluation and Monitoring of Skill Development Programme. * Assist the Board of procurement of goods & services of the Board, Preparation and Evaluation of Tender Documents. * Assist the Board in modernization of work process through development of software-based application system, management & proper record keeping of Beneficiary records/data etc. Applications must be submitted in dosed envelops in the office of the undersigned with the following documents (self-attested), Proof of educational qualification, experience as detailed above, Two recent passport size photograh, age proof, mobile number and email ID of applicant and self-addressed stamped envelops. Applications received after the last date and time of receipt shall be automatically rejected. Only short listed candidates will be called for interview for which separate communication will be made. Preference will be given to candidate, having experience in Govt. Sector. The undersigned reserve the right to reject any or all applications without assigning any reasons thereof.